This behind the scenes video examines the extensive V-Mixing System setup and interviews the technical and production staff on operation and system setup for the Gino Vannelli Live in LA DVD. 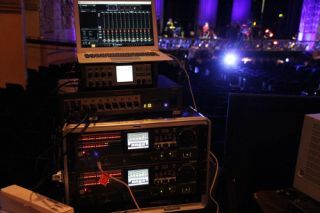 Ross Vannelli mixed at FOH using the Roland M-480 console with inputs from an S-4000-3208. A split also fed the monitoring system where Matt Greco, monitor engineer, used the Roland M-380 console to control both IEMs for Gino and other frontline musicians and M-48 personal mixers for the rest of the band. Nick Moon, recording engineering, took splits off of the S-4000D directly to two R-1000 Multi-Channel Recorders to capture all of the live audio channels redundantly. Nick Moon was also responsible for mixing and mastering the live concert in both stereo and 5.1 surround.